Nestled in the very heart of urban Phoenix, Willo Historic District was once the epitome of suburbia; a collection of subdivisions on the outskirts of the small, but thriving metropolis of Phoenix. The Willo neighborhood between 7th and Central Avenues can be divided into two sections. J. P. Holcomb used a Homestead Patent in 1878 to acquire and settle the southern portion of Willo between Encanto Blvd. and McDowell. Mr. Holcomb acquired the northern portion, between Thomas Rd. and Encanto Blvd. in 1886 through a Timber Culture Land Patent. Standards were set for residential construction, and exhibition houses (now called model homes) were developed to market the new construction. Most of the building activity in Willo during this period occurred in the N. Kenilworth and Broadmoor subdivisions, and included a Spanish Rancho Home exhibition house. In all, 22 separate subdivisions were platted and developed in Willo by various entrepreneurs from the turn of the century up to the beginning of WWII. Eventually, with the growth of Phoenix over the last century, the individual subdivisions platted by early developers were forgotten and the area blended into one cohesive whole. Unfortunately, the amazing growth of the city resulted in the encroachment of commercial development on what were once quiet suburbs. In the 1980’s, residents of Willo successfully lobbied for status as a special conservation district, achieving historic status and assuring that this beautiful part of Phoenix history will be preserved for the enjoyment of future generations. The historic development of Willo was the result of deliberate actions that shaped and controlled the neighborhood’s visual and social characteristics. Many parties, including the local and national real estate trade, prominent civic leaders and the federal government, were responsible for these actions. Over 700 homes were constructed in Willo, making it one of Phoenix largest historic neighborhoods. Seventeen subdivisions were platted in Willo, each indicative of the land development and architectural trends of their time. This brochure describes how the resources of public agencies, private firms and organizations were used to create the Willo community. In the early 1920’s, most of the Willo historic homes area was undeveloped agricultural land on the outskirts of the city. It was difficult to attract families to build their homes in Willo because of its somewhat isolated nature. Home Builders, a speculative residential construction firm, saw great opportunity in this new area. Through the large-scale construction of homes, the company had the opportunity to create a new community, an atmosphere that encouraged people to purchase a house. Home Builders constructed 41 residences in Willo between 1920 and 1925, each in the same architectural style. The company was also responsible for the marketing of these residences, offering an affordable time payment plan, which appealed to middle class homebuyers. Home Builders thus set the standard for the appearance of the neighborhood, the quality of buildings to be located there and the economic and social characteristics of the area’s residents. Home Builders, like other builders of that time, constructed homes in the Bungalow style. Bungalows have large porches and broad roof overhangs and are usually one story. Wood clapboard, wood shingles, and stucco or brick masonry form exterior walls. The Bungalow style easily accepts simple plan variations and emphasizes the use of common building materials such as brick and wood, making the Bungalow simple and inexpensive to construct. During the mid to late 1920’s, Phoenix witnessed phenomenal growth in its population and a great expansion of its city limits. Consequently, there was a growing concern over how the City should accommodate this growth without losing its unique qualities. Civic leaders and members of the local real estate trade agreed that haphazard development would be detrimental both to the current residential population and to property values. The residential building developers of Willo Historic Phoenix used four strategies to accomplish their goal of forging an economically and socially viable community: deed restrictions and protective covenants; platting large-scale subdivisions; constructing model homes and supporting the local zoning movement. Unlike Home Builders, these early developers only sold residential lots; they did not build speculative homes. Subdividers controlled land values by placing building restriction clauses on the lots sold. For example, a building cost restriction of $2,500 would prevent those of modest means from building there and would dictate the quality of materials chosen for the structure. Other restrictions regulated specific building materials and types of building use, such as excluding an apartment house from a subdivision. As in many parts of the nation, racial restrictions were imposed as well. These restrictions gave Willo an upper middle class identity. Many store owners; professionals and upper echelon public service employees were the initial homebuyers in Willo. Developers also set the tone of development in Willo subdivisions with the use of model homes. The National Association of Real Estate Boards, local real estate firms and the American Construction Council sponsored a national program of model home construction during this period. This program emphasized the American Dream of home ownership as a marketing tool. New building technology was promoted in the model home campaign as well, offering added convenience and low building costs for homebuyers. The Spanish Rancho Home, the first building constructed in the Broadmoor Subdivision, was an exhibition house. The house received wide publicity during its construction and opening. The interior was decorated, and the latest electrical, plumbing and heating systems installed and brought to the attention of the visiting public. After the house had successfully attracted prospective lot buyers to the subdivision and had set the architectural standard for the area, the building was sold to a private buyer. Most of the building activity in the late 1920’s occurred in the large North Kenilworth and Broadmoor subdivisions. Both were platted in 1928. By purchasing lots in large subdivisions, prospective homeowners were assured of neighbors who would meet the same deed requirements as they did, thereby guaranteeing social homogeneity in the area. The large size of the subdivisions offered the opportunity for a creative layout of lots and streets. The curvilinear street pattern of Broadmoor was touted for its design along 11 artistic lines in keeping with the city beautification and planning movement of the period. While deed restrictions assured Willo residents that nearby buildings would be of a character similar to their own, there was no means by which residents could control development immediately beyond the boundaries of their subdivision. However, by the 1910’s, large cities adopted zoning ordinances which granted municipalities the authority to regulate development within their city limits. Following suit, Phoenix civic leaders recognized that a zoning ordinance was an essential feature of a modern city. Therefore, the city hired a prominent San Francisco consultant to draft a zoning code for Phoenix. The first zoning ordinance was passed in 1930. Zoning was supported by the local realtors for its ability to stabilize property values. William Hartranft, the first chairman of the Phoenix Planning Commission and a longtime resident of Willo galvanized their support. With the exception of a few lots zoned 11 neighborhood commercial at major street intersections, all the Willo area was designated for single- family residential use. An exception was the provision for modest apartment buildings (such as the El Encanto Apartments) along Central Avenue, which was the historic edge of the Willo neighborhood. The Spanish Rancho Home’s design reflects the influence and popularity of the Spanish Colonial style through the mid and late 1920’s. By the early 1930’s, the Period Revival movement introduced a range of historical styles reflecting picturesque images of early American or European domestic architecture. Period Revival was the dominant style in California at the time, a factor that influenced design trends in Phoenix. The Spanish Colonial Revival style was first exhibited before the American public at the 1915 Pan-American Exposition in San Diego. Characteristics of these low, horizontal one or two story buildings include simple stucco or plaster walls and chimneys, low-pitched red tile gable roofs, arched window and door openings and modest detailing from several earlier eras of Spanish and Mexican architecture. Tudor/Elizabethan Revival buildings in Willo have their origins in medieval England. The style, which was often described as picturesque and romantic, is characterized by its irregular shape; steep roof with sharp gables accented with half-timbering details; large chimney; cast concrete or stone-framed doors and various combinations of sheathing materials such as rough stone, stucco and brick. An interesting variation of the Tudor / Elizabethan Revival found in Willo is the Cotswold Cottage. The style’s most distinguishing feature is its curved wood shingle roof, which suggests the appearance of a historic English thatched roof. Also found in Willo are examples of the American Colonial Revival style. Although American Colonial is the nation’s most popular revival style, it is not extensively represented in Phoenix. Characteristics of the style include Greek Revival door and window surrounds; shuttered, multi-paned windows; low-to-medium pitched gabled roofs, usually with the broadside facing the street and wood clapboard or brick outer walls. The worst years of the local economic depression, 1931 through 1935, are illustrated by the virtual standstill of real estate development and construction activity in the Willo neighborhood. The National Housing Act of 1934 rejuvenated residential growth in Willo. The purpose of the Act was to improve nationwide housing standards, provide employment and stimulate industry, improve conditions with respect to home mortgage financing, and to realize a greater degree of stability in residential construction. The Act created the Federal Housing Administration (FHA) that stimulated new construction by insuring residential mortgages, thus making them easier to obtain. In return, the FHA required that housing built with insured loans meet certain design and construction standards. The development of Willo during this period was a direct consequence of Phoenix’ zoning regulations converging with the policies of the FHA. The City’s zoning regulations established types of land uses in Phoenix. The FHA policies mandated a specific palette of building materials and designs, which could be used to qualify for financing programs. The program also encouraged speculative development in large subdivisions by limiting the risk of mortgage foreclosure and by increasing demand for houses based on the FHA’s low interest rates. As a result of these influences, like no other time in Phoenix history, there was a uniform, coordinated and controlled vision for developing new residential areas of the city. The FHA’s directives gave developers a blueprint for the most cost efficient and marketable designs. The FHA sought uniformity in their subdivisions in hopes of creating stable, secure and attractive communities. Building components and styles were mass-produced, thereby cutting costs. Developers were able to plat and subdivide property confidently, for they were assured of financial backing from the banks. In an effort to boost the public’s awareness of their mortgage financing and to show future homeowners the advantages of the program, the FHA, with local lending institutions and building contractors, sponsored the construction of two demonstration houses in the Willo neighborhood. The houses, built in the summer and fall of 1936, were constructed for private owners but were opened for public inspection to demonstrate the ultra modern dwellings achieved through FHA financing. The prominent and prolific Phoenix architectural firm of Lescher and Mahoney designed both of these homes. The P.W. Westerlund House, designated the House of Romance, was the first of three houses to be built Economy of construction and convenience were billed as the main features of the house. The Home of Happiness was the second FHA sponsored demonstration home in Willo. The Arizona State Fireman’s Association sponsored the Miracle demonstration home in Willo. This home, which was endorsed by the FHA, promoted the use of fireproof construction materials such as adobe, cement, steel and asbestos. Unlike the architecturally diverse subdivisions developed during the 1920’s, the subdivisions developed in Willo during the New Deal years are more uniform in appearance. This uniformity was a response of local developers to federal housing initiatives. FHA era houses were constructed in two basic styles: French Provincial and Monterey. The FHA borrowed the general shape of their homes from the Period Revival styles but stripped the houses of elaborate exterior details, ornamentation and finishes. Built when the private automobile had become the dominant mode of transportation, these buildings incorporate garages or carports into their design. The most distinctive feature of the Phoenix-FHA interpretation of the French Provincial style is its steeply pitched, hipped roof. These one-story buildings are asymmetrical in plan and have interlocking wings, giving the appearance of a rambling farmhouse. 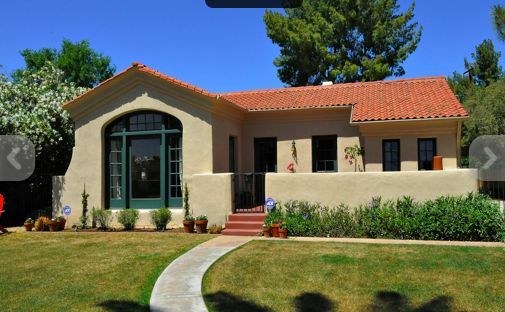 The Phoenix version of the FHA Monterey style is a forerunner of the modern Ranch style house. These are one-story structures with a low, horizontal orientation and an asymmetrical front facade. Exterior walls are covered by stucco or plaster. They have low-pitched gabled roofs usually sheathed in Spanish tile, and have adjoining garages. The effort to maintain the Willo neighborhood’s character still continues. In 1986, Willo residents and city officials prepared the Willo Neighborhood Conservation plan, addressing such quality-of life issues as the development of high-rise office buildings in the area. In 1990, a neighborhood coalition successfully promoted designation of Willo as a local historic district. With the continuing commitment of its residents, the Willo neighborhood will remain proud of its past and preserving the neighborhood’s unique qualities for the future.